To make the patties combine the chicken, onion, garlic, cilantro and five spice. Season lightly with salt and pepper. Shape into 20 slider sized patties and drizzle with olive oil. Set aside. In a small saucepan combine the cornstarch, fish sauce, peanut butter, vinegar, chilli sauce and brown sugar. Bring to the boil and reduce heat to simmer for 3 minutes. 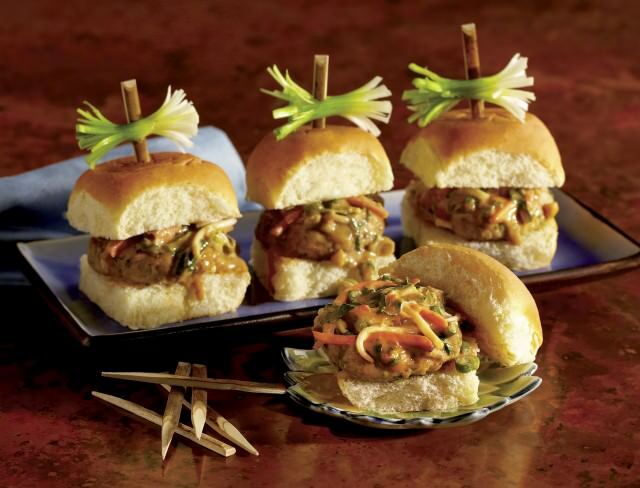 Begin to cook the sliders on a large grill or pan. Add the cabbage, bean sprouts and carrot to the pad thai sauce. Assemble the burger by slicing the sliders in half, adding a patty and topping with the sauce. Add the slider roll tops and serve.